Ella and Max Piskun launched their contemporary bakery last year, and hope to soon have a storefront. Ella Piskun's sweet treats look nearly too pretty to eat. Potential customers scrolling through social media photos of the young pastry prodigy's creations for her Spokane bakery miFlavour are met by images of decadent, perfectly edged and glaze-finished desserts in all colors, flavors and styles. Piskun's Pinterest board-worthy cakes, however, are only a small sampling of what she can whip up from scratch in miFlavour's downtown Spokane kitchen, located inside the Montvale Event Center. 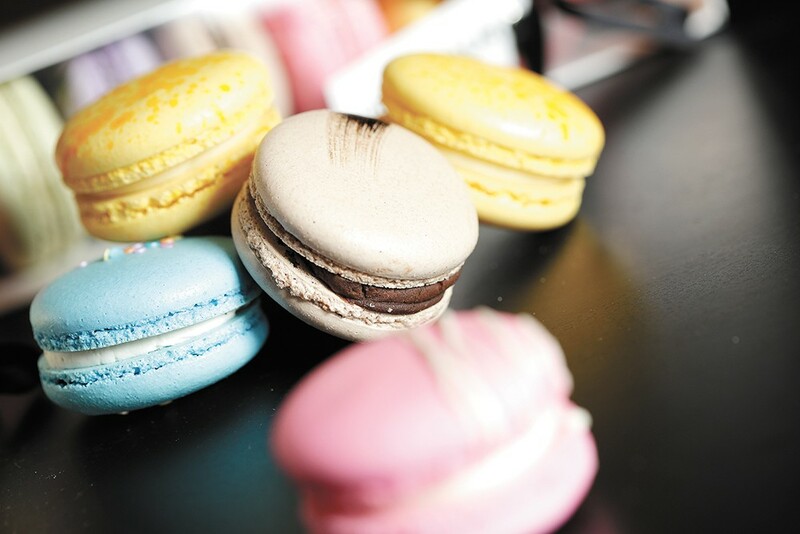 The fledgling contemporary bakery, which she launched a year ago with her husband Max Piskun, is also looking to establish a local foothold on the French macaron market. miFlavour's meringue-based, flavored sandwich cookies — for which Ella has perfected her not-too-sweet, yet not-too-bland recipe — can be found in several local grocers' pastry cases across town, and come in 10 staple flavors, as well as seasonal combinations like pumpkin spice. The 22-year-old pastry chef, who graduated in 2015 from the Inland Northwest Culinary Institute at Spokane Community College and gained experience during stints at Petit Chat and Common Crumb bakeries, also strives to make the size of miFlavour's macarons slightly larger than the typical industry standard. "We have had more than four customers who visited France recently and they came home and said [our macarons] taste better than the original ones from France," says Max Piskun, 27, who handles the bakery's management and marketing so his wife can focus on perfecting recipes and overall production. "That has been a cool experience to hear," he adds. miFlavor's specialty macarons ($2.50 each), which are regularly available at My Fresh Basket, Rocket Market, Huckleberry's Natural Market and Main Market Co-op, come in a range of flavors, like Ella's own recipe for a London Fog latte cookie that incorporates Earl Grey tea leaves into the batter and filling (versus artificial flavors), to classics like chocolate and coconut. Each macaron is filled with Italian-style buttercream or ganache; some filling flavors incorporate berry purée or fruit jams. "We try and focus on desserts that are less sweet," Ella says. "Everything these days is so sugary — there is no flavor to it, it's just sugar. We try and use natural ingredients, so we go pick fruit at Green Bluff, and we try and let the flavors speak for themselves." 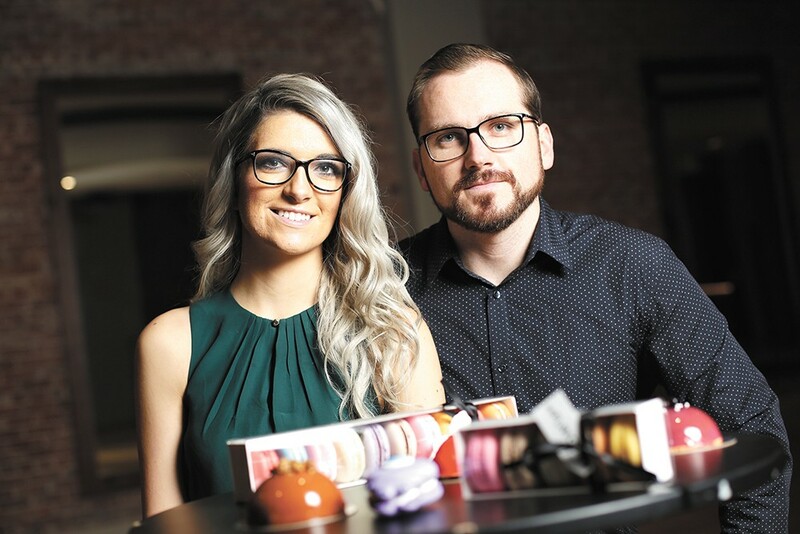 Each macaron, as well as products in miFlavour's other categories, are designated by memorable first names to make ordering easier for repeat customers, and to stand out from the crowd, the couple explains. Their lavender macaron cookie, for example, each of which feature a hand-painted lavender flower, is called "May." The red velvet version is "Alva," and Ella's favorite, the London Fog Earl Grey, is named "Landon." Piskun has also designed several whimsically shaped and flavored macarons for a few of miFlavour's wholesale accounts. Exclusively at Huckleberry's, customers can find the two cake-batter-flavor unicorns, "Sparkles" and "Vibes." Rocket Market also has its own design, a purple-colored monster macaron, and for the cold months ahead, the bakery is getting ready to roll out a cute snowman-shaped cookie. miFlavour's macarons are available at several grocers in Spokane. While customers can currently find miFlavour's signature macarons and three of their signature cakes (the chocolate "Zee," the white chocolate coconut "Rosey" and one rotating seasonal flavor) sold by the slice at local grocers, the bakery also regularly fills custom orders for its many other cakes, confections and pastries. Along with their macarons, the Piskuns' glazed mousse cakes — sold in full-size cakes or individual, dome-shaped portions — are yet another major brand focus. "There's a little layer of cake on the bottom, and then a layer of mousse and some layer of filling — fruit, chocolate, toffee or something crunchy — and then it's covered with more mousse on top, and finished off with a mirror glaze that's super shiny," says Ella. "They're all different colors." Beyond these specialties, miFlavour's kitchen is equipped to bake pies, scones, tarts, fruit bars, cupcakes, brownies, cookies, biscotti, several other French pastries, and select confections, like zefir, a marshmallow-like treat. Any of the base products shown on the bakery's website can be ordered exactly as presented, or Ella and her still-growing baking team (she has a full-time staff of two) can change the flavors, color palette, ingredients, and request custom decorations. miFlavour's owners pride themselves on being able to fulfill even the most complex orders, like a past birthday cake for a little boy who was allergic to most common baking ingredients, including eggs, wheat and dairy. One of Ella's most unique past requests, for a traditional Swedish princess cake, has also become a featured cake in miFlavour's regular lineup, called the "Astrid." "[The customer] had called around town trying to find this cake," Ella says. "I researched and tried to find the most original recipe that hadn't been changed, and he fell in love with it and said 'This is just what we used to eat when we were kids!' It's a sponge cake with pastry cream, raspberry jam and covered in green marzipan, but it's layered in a very specific way." "A lot of the desserts are based on what customers love," Max adds. "We base them on what people love, not what we want to make." Though miFlavour recently moved into its current commercial kitchen space, the Piskuns continue to work toward their goal of opening a retail storefront in downtown Spokane in the near future. Eventually, they hope to expand with more locations across the Pacific Northwest. To see all of miFlavour's products and place an order, visit miflavour.com.